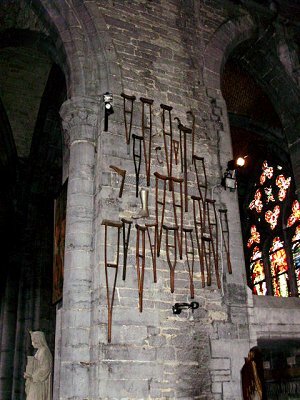 Walcourt lies in the county of Namur, 15 km South of Charleroi; the Black Madonna resides in the Basilica of St. Materne, also known as Basilica Notre-Dame de Walcourt, Grand Place, sculpted between 957 and 1020 in lime wood and covered with silver. More silver layers added in 13th and 17th centuries. 62 cm. 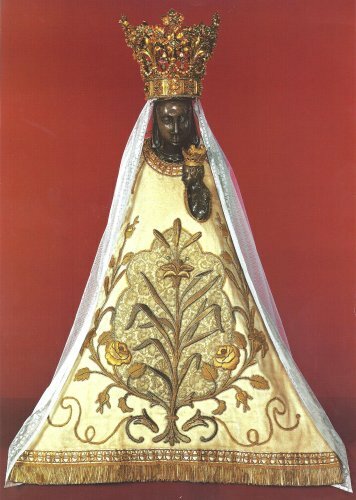 The roots of this Black Madonna go back to the 4th century, when the bishop of Cologne and Tongeren (both cities with Black Madonnas to this day) replaced a statue of a Pagan goddess in Walcourt with one of the Virgin Mary. We don’t know what happened to this first statue. The present Madonna stems from the time when the first real church was built in Walcourt (992 – 1026) and dedicated to Mary. This makes her one of the oldest statues in Western Christianity, as the Belgians like to say (North-Western maybe). (*1) She has been deemed black and miraculous ever since supernatural forces saved her from a fire in the year 1220. Legend recounts that when the fire had almost completely destroyed the church already, the Madonna flew out of the flames and landed in a tree in a place called Le Jardinet, not too far from the church. When all the attempts to get her down from the tree failed, the people and clergy asked their feudal lord Thiéry II of Walcourt for help. He prayed under the tree, asking the Black Madonna to come down and let herself be brought to a shrine where the people could honor her again. When he promised to rebuild her church and to found a monastery at the place of the tree she landed in, she accepted, descended into his arms,(*2) and allowed herself to be placed in a church. How exactly did she fly from the flames? The oldest version of the legend doesn’t seem to answer that question. Later two accounts arose: the one more prominently depicted in the church, shows her being carried by angels. The other, quoted by Ean Begg, states that she was lifted out of the fire by doves. (*3) Belgium is the country where the breeding of racing pigeons started in the later 1800’s, making some people very passionate about those birds. So it makes sense that they wanted to see their pigeons as having a special connection to Heaven. She still wears a mantel sometimes that is decorated with doves. Our Lady of Walcourt was canonically crowned in 1875 and her annual procession still continues to this day, on the first Sunday following Pentecost. It began around 1329 with hopes of protecting against the plague. The Black Madonna without her robes, showing the rod to which the crown is attached so it doesn't fall during processions. Is the Madonna really black? He bases the first part of this statement on a quote from the findings of the Royal Institute of Artistic Patrimony, which renovated the statue in 1988, because she was infested with wood worms. While they were right to mention in their report that the original statue was polychrome (painted with several colors), not black, I doubt that they were addressing the theological concept of Black Madonnas. It is not a prerequisite of a Black Madonna to have to have been black from her inception. As I explain in the introduction under the subheading The Church's explanations for Black Madonnas, the faithful beautifully interpret a Madonna’s darkening over time as a sign of her taking on and purifying their sins. Countless Black Madonnas darkened over time for various reasons without anybody doubting that they are in fact Black Madonnas. The Church often equates Black Madonnas with the bride in the Song of Songs 1:5-6, who says of herself: “I am dark but beautiful, o daughters of Jerusalem, as the tents of Kedar, as the curtains of Salma. Do not stare at me because I am black, because the sun has burned me." So the Biblical prototype of Black Madonnas also wasn’t black from the start, but got burnt by the sun. So just because a couple of people want to disqualify a Madonna as Black by giving “the facts” about what blackened her, doesn’t mean they are right. I think the fact that Our Lady of Walcourt is listed in Ean Begg’s index and that someone feels the need to state that she isn’t a Black Virgin, even though she appears to be one, proves that she is indeed regarded as such in popular view. I don’t think it is a coincidence that on the same day in 2012, on which I visited the Black Madonna of Walcourt I also visited the Black Madonna of Maillen and had a very similar experience: The sign on the road pointed to the “Black Virgin” in the woods, all the people of the village have known her as such for generations, but the “better educated” gentleman in the manor house next door claims she is not a Black Virgin, that she merely looks black because the metal she is made of oxidized. Well, the whole phenomenon of Black Madonnas didn’t spring from educated minds, but from the needs of the common people. It is interesting to note that in 1985 Ean Begg says about Our Lady of Walcourt: “Popular legend says the statue blackened in a fire”(*5) and 3 years later it turns out the legend is true, even in the historical sense. One should never dismiss legends too quickly. They usually contain at least a grain of truth. 1. There was a poor miner in Walcourt who was trapped in a collapsed iron mine for a whole year. Thinking he was about to die, he prayed the Hail Mary, ending with: “pray for us sinners, now and at the hour of our death. Amen” “That was his salvation” says the church’s booklet. (*7) Meanwhile his wife mourned him as dead and had his funeral mass celebrated. Then she attended mass every Monday, because in that region, Monday masses were celebrated especially for the deceased. During those masses she would offer a little loaf of bread as part of the offertory, to help the soul of her husband, whom she expected to be suffering in purgatory. A year after the accident, the owner of the mine decided to excavate and repair the mine. After much digging, the workers heard a voice demanding: “Don’t hit so hard, you’re going to injure me!” Not knowing what kind of spirit they had come upon, they ran to get the boss and a priest before they dared to excavate further. To everyone’s delight they discovered not a ghost but the living miner, who explained that he had survived because every Monday the Holy Virgin brought him a little loaf of bread, like the one his wife was offering for him in church. Ex-voti in the chapel of the Black Madonna tell stories of salvation: prisoners freed and the lame healed through Mary's intercession. 2. There was an impious miller who disregarded the commandments of the Church and worked on a feast day of the Blessed Mother. When he hit his mill stone, a chip of it flew into his eye and no doctor could remove it. On the contrary, it kept getting bigger, until the man realized that he had offended the Virgin Mary and undertook a pilgrimage to the Black Madonna of Walcourt. As he was praying for forgiveness at her feet, the stone fell out of his eye. To this day it is kept as an ex-voto in the treasury of the church. 3. There are many accounts of the Madonna bringing still born infants back to life just long enough so they could be baptized. Families would suffer greatly, thinking their dead babies couldn’t go to Heaven because they weren’t baptized. This account is particularly moving. A group of women had spent three days before Our Lady of Walcourt, praying over a dead baby. Finally, in the middle of the night, it gradually came back to life. Its color changed from the dark bluish hue of death first to a pale white, then to a rosy red. Its mouth opened, tongue moved, and blood filled its veins. At the same time the statue was also undergoing color changes. First she turned a sick looking brown, then she cleared up and became beautiful again. Not knowing if there was time to call a priest, and since any Christian is allowed to baptize in case of emergency, the women quickly used the prescribed formula: “Child, if you are alive, I baptize you in the name of the Father, the Son, and the Holy Spirit.” As soon as the baby was thus ready to enter Heaven it lost its red color again and passed. This time the women didn’t cry, because they knew that their divine Mother had made that baby her own. 4. There was a criminal, condemned to death for several crimes. He was attached to a horse that was to bring him to the gallows. But he had some devotion to Mary and had never failed to attend the annual procession in honor of Our Lady of Walcourt. So he began to pray and promised Mary that he would serve her better than ever before, if only she saved him. With that, the horse took the path to Walcourt and went right into the church, just at the moment when the procession was about to start. 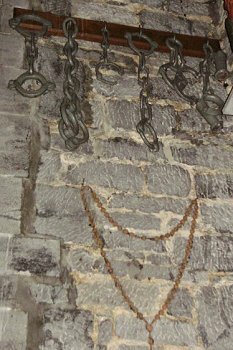 His chains fell off and he was able to participate in the festivities as an act of thanksgiving for the life he owed his Heavenly Mother. *1: In a booklet published by the parish of Walcourt in 2000: George Dereine, Le Culte de Notre-Dame de Walcourt, p. 35.